Note: the former title of this book was A Skeptic's Dictionary for Kids. Mysteries and Science is for kids 9 and up. It takes a look at weird things from abracadabra to zombies. What does science have to say about things like astrology, Bigfoot, dowsing, ESP, ghosts, and monsters? These and other similar topics are covered here, including predictions of the end of the world, palm reading, and vampires. In all, Science and Mysteries takes you on a journey through fifty chapters. 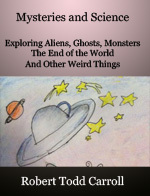 Some chapters deal with weird things, some deal with how scientists think and what kinds of tools they use to investigate things. We may not always agree with scientists, but they make us think. And thinking is always a good thing. E-book available for $6.99 from Amazon for Kindle, Kindle Fire, Kindle Fire HD, iPad, and iPhone. E-book available for $6.99 from Barnes & Noble for Nook. You don't need a Nook to enjoy a Nook book. Free apps available from Barnes & Noble will let you read a Nook book on your tablet, smart phone, or computer.